As agency group M&A deals decline, private-equity and consultancies are picking up the pace and acquiring capabilities in the "heartland" of advertising and marketing. 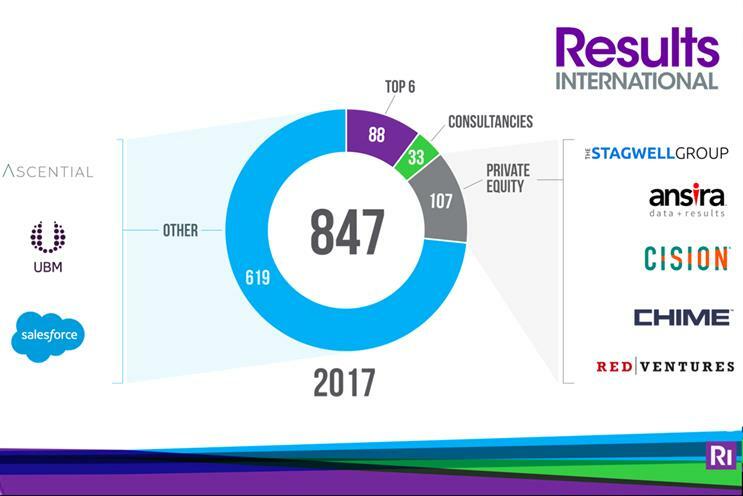 During a preview of Results International’s most recent report at Campaign’s Breakfast Briefing last week, partner Julie Langley pointed out that while agency holding groups still led with 88 M&A deals, the rising numbers of acquisitions by consultancies and private equity firms could not be ignored. In 2017, there were 31 private equity-backed deals in the last quarter of the year, representing 16.1% of all marcoms deals that quarter. Total private equity activity for the year was 107 transactions, up from 94 the year before. One of the more notable private equity deals in Q4 was Bain Capital acquiring an 87% stake in Asatsu-DK, Japan’s third-largest ad agency, for $1.4bn (£1.01bn). Another was Equistone buying Birmingham-based outsourced marketing services agency Inspired Thinking Group from Bridgepoint. In addition, a number of new management consultancies are now dipping their toes into marcoms – primarily in digital businesses. These new consultancies include Cognizant, which acquired UK digital agency, Zone; Concentrix which bought Tigerspike; and Capgemini which acquired Idean and Lyons. 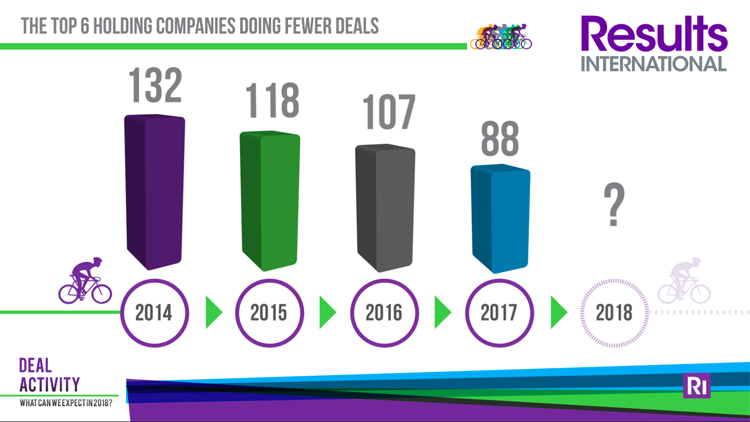 In 2017, consultancies made 33 deals in the marcoms space overall. "The networks have stopped focusing on acquisitions and are instead working on making what they already have work better," Langley said pointing to a chart that showed acquisitions by the big six agency holding companies dropping year on year. "In contrast, consultancies are doing more and more deals each year. These deals are getting larger and are moving into the core heartland of the advertising and marketing space," she said. The rising number of private equity-backed deals too could be a "sign of things to come" she continued. "PE clearly now has the appetite for big deals and seeing good exits will give them more confidence that they can make money in marcoms." The poor share price performance of the agency holding companies in 2017 may have made them targets for these private equity players this year, Langley added. "The largest listed groups like WPP, Publicis and Omnicom are probably too large, but we could see private equity interest in the smaller listed groups." 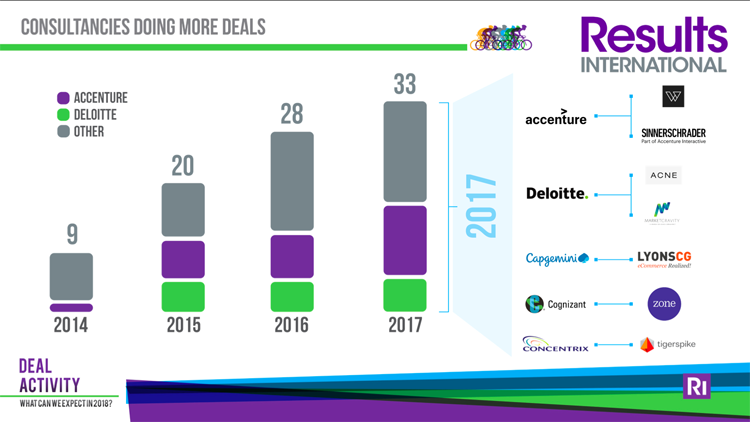 Another key focus of M&A deals in 2017 is an increased interest in agencies in Western Europe. A quarter of deals took place in that region, up from 19% in 2016 while UK deals fell from 15% to 12% over the same period. The report also found that Western Europe was also the only region globally to see an increase in overall deal volumes over the same period, from 197 to 210. In total, there were also 847 deals worldwide last year, down from the 1,023 seen in 2016. Some of the bigger deals were Orient Hontai acquiring a 54% stake in Spanish marketing group Imagina for more than $1bn (£720m), Accenture buying SinnerSchrader AG in Germany and Dentsu Aegis acquiring Oxyma Group in the Netherlands. "Brexit is, of course, part of the reason driving this trend," Langley said during her presentation. "As advertisers put pressure on agencies to provide a consistent global presence, they have had to respond." 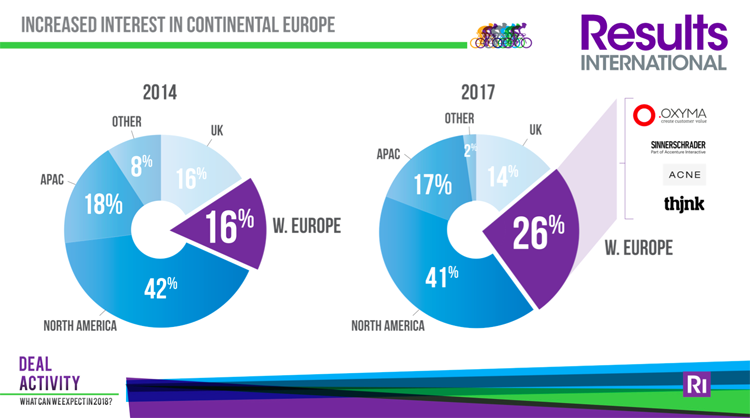 In the report, Langley observed that many US acquirers have made substantial buys in the UK over the past two years so it is natural for them to now turn their attention to the major European continental markets. Going into the year ahead, Langley expects quite a lot of change for the M&A deals in marcomms: "Who is buying, where they’re buying, what they’re buying and why they’re buying are all changing." Buyer interest in 2018 is expected to centre around the convergence of physical and digital environments; proprietary data and data skills; digital transformation; transparent media buying; and content, she concluded.